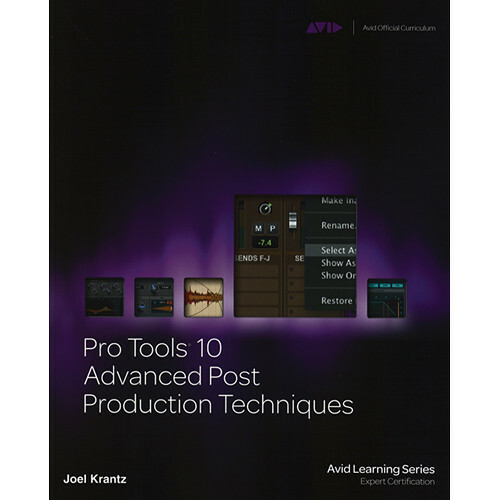 Pro Tools 10 Advanced Post Production Techniques from Course Technology and written by Joel Krantz is the go-to guide focused on advanced operation of Pro Tools 10 in a professional post-production environment. Today's and tomorrow's post engineers simply must know the ins and outs of this popular software---the industry standard---and this book shows the way. It includes technical insights into Pro Tools hardware and software and offers hands-on exercises, discussion of common workflows, and intermediate-advanced topics, detailing how to use a Pro Tools|HD system to record, edit, mix, and output sound for professional film and video applications. Using real-world examples and projects, Pro Tools 10 Advanced Post Production Techniques gets you up to speed on Pro Tools for post as quickly and easily as possible. About the Author: Joel Krantz is a full-time professor of sound with more than 20 years of experience. He currently teaches at California State University, Northridge. He is also an Avid Certified Pro Tools instructor, teaching at Video Symphony (Burbank, CA). In addition to his teaching duties, Joel is a freelance sound editor, mixer, and consultant with experience working on television and film projects. Most recently, Joel edited and mixed a documentary feature film, War of the Gods. In addition to teaching and sound editing/mixing, Joel collaborated with Avid to write/co-write more than 20 training books.